Air quality is tracked daily based on ozone levels and particle pollution. Shown on the chart, orange and green days are unhealthy for sensitive groups, red and purple days are unhealthy for all. 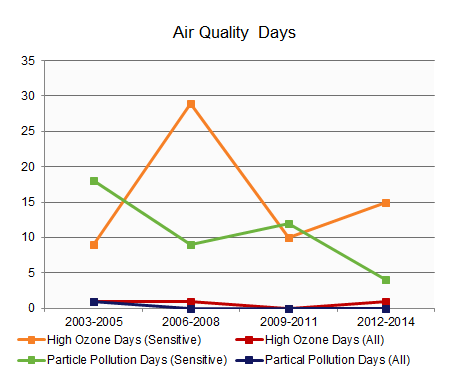 2012-2014 showed a significant decrease in particle pollution and a dramatic increase in high ozone days for sensitive groups.